The expedition began January 2nd in the Mississippi Delta near Buras, Louisiana. 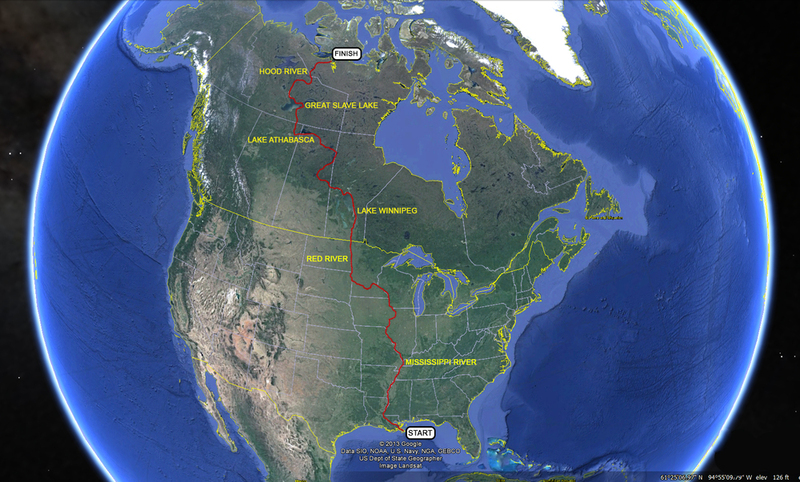 From there, it was a long 2,000 miles upriver, traveling north through Memphis, Tennessee and Saint Louis, Missouri (among many other US cities) before we reached the Minnesota River, which lies just south of Minneapolis/Saint Paul around the beginning of April. The Minnesota River flows southwest for 70 miles before altering its course back northwest. We followed the Little Minnesota River, one of the Minnesota's tributaries, and headed-up to Browns Valley, Minnesota. After a short portage, we arrived on Lake Traverse and followed the Bois des Sioux River to the Red River, which flows all the way to Lake Winnipeg across the border between the United States and Canada. By the time we were on the north end of Lake Winnipeg, we'd already traveled over 3,000 miles by the middle of May. The Saskatchewan River flows into the northwest end of Lake Winnipeg. We traveled upriver on the Saskatchewan and followed one of its tributaries, the Sturgeon-Weir River, until we reached Frog Portage by late June. From there, we paddled the classic Churchill River until it was time to put the boats on our backs again for the infamous Methye Portage, a fifteen-mile trail that connected us with the water system feeding Lake Athabasca and Great Slave Lake. With the Clearwater River and Fort McMurray in the rear-view mirror days later, we traveled the Slave River, which flows out the west end of Lake Athabasca 200 miles before reaching Great Slave Lake. It's a lot of shoreline along the northeast arm of Great Slave Lake and back west through Yellowknife before we paddled upstream on the Marian River. We continued upstream on the Emile River, a tributary of the Marian before heading downstream on the Parent River. The Parent River joins the Coppermine River at Red Rock Lake, and then the final descent into the Hamlet of Kugluktuk.